Is season 4 of Once Upon A Time off to a chilly start? Maybe it’s just me, but after being left less than impressed with the season four premiere, I can’t say I thoroughly enjoyed this second episode. An episode that was 98% Regina and Rumple free. Now, normally, those viewers that are tired of them would probably enjoy this…but are the Frozen subplots enough? Hang in there, Joan. So, Anna is off to the Enchanted Forest. She goes to visit a family friend for help with her “secret mission”. Friend happens to be Charming, lookin’ like Hagrid, during his Shepherd and farming days. Anna has come at a bad time. 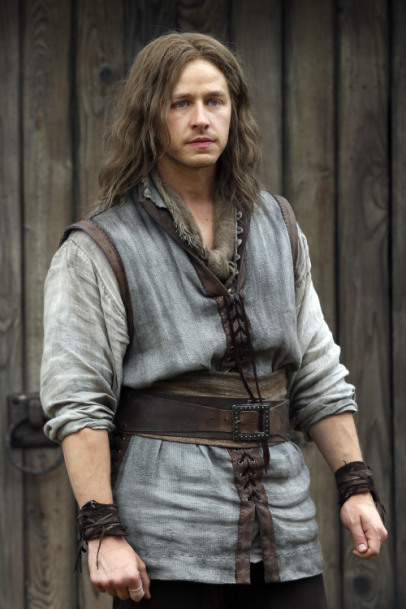 Charming and his mother are being threatened by a new villain…Bo Peep. Homegirl doesn’t need her sheep when she’s makin’ slaves, taking names, and all their money. Anna is disappointed by Charming’s cowardice and teaches him how to fight with a sword and stand up for himself. So basically, we all have Anna to thank for the Charming of today. Thanks, Anna. Have fun on your new quest to see Rumplestiltskin. Grumpy and Granny let Snow know that she should be in charge now and fix things. She has had no sleep, she’s breastfeeding, and she is just not here for that. She lets out an epic rant. Snap. Speaking of Regina, early in the episode she sends Henry a note that she doesn’t want to see him right now. She’s one of us. But Henry, who has nothing else to do in this story, let’s be real, demands to be let back in the house because he misses his room. Not Regina or anything. His room. Disco inferno! Okay. So, Elsa really can’t conceal or control her feels. 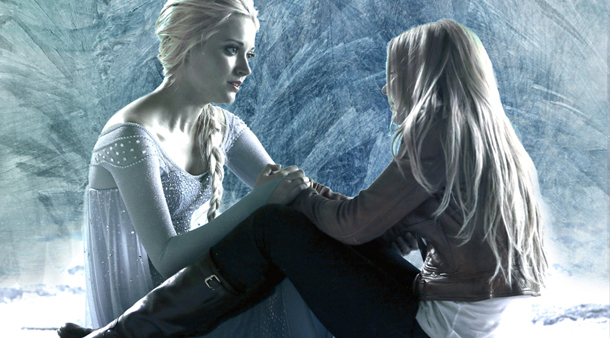 She ends up trapping both her and Emma inside the ice fortress. Now it’s a race against the clock to get Emma out of there before she freezes to death or Hook hacks off his hook. Anyone finding his panic a bit forced this week? Anna is able to control herself and melt a small hole for them to escape but she can’t get rid of the whole thing. Why not? Who else has these ice powers? The Snow Queen. AKA guest star Elizabeth Mitchell. I’m curious what she’ll be up to next week, besides unsanitary ice cream practices. There were quite a number of not-so-inside-jokes to Frozen this week. And not just Anna’s alias of “Joan”. Emma: You put on quite a show. Elsa: The cold’s never bothered me. What did you guys think of Once Upon A Time 4×02? Are you here for Emma and Hook? Are you excited for the Snow Queen?